The only issue I have with Stray is the constant early mornings. At least with the car you can dictate when you want to get up… 7:30am every day when you are on holiday is not always the most fun. But Stray is all about getting you “out there” and that generally means longer drives and earlier starts. We leave Hahei at a suitably early time for the long drive to Raglan. There are a couple of stops along the way, including in Hamilton (where we watched the cricket) and in Paeroa, home of NZ’s “world famous” Lemon&Paeroa (L&P) drink. It’s fizzy, so obviously I don’t like it, but apparently it goes great with Canadian Club. What doesn’t mix well with canucks, eh? Raglan itself is a surfer’s haven. Even the main beach isn’t so much sand as a grassy hill overlooking great surfing waves. A few of the people on the bus head off to learn how to catch a wave, but I’ve fulfilled my surfing quota for this holiday. The hostel in Raglan is nestled up in the trees and hosting a wedding, so unfortunately we can’t take part in the free flying fox. And after our bottle of pesto sauce goes missing, Lofty and I improvise a pasta with ingredients from our giant orange cool bag and the ubiquitous ‘free shelf’. Turns out great! Waitomo is glowworm central. I had my first glowworm experience in Dunedin, where a path from our campsite led to a small enclave filled with the little lights (we only got a little bit lost in the dark, thank god for head torches). Waitomo is also home to ‘black water rafting,’ something that sounds different and cool but in reality is quite tame, at least by my adrenaline standards. 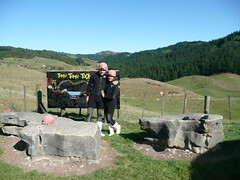 We get kitted out in thick black wetsuits, helmets and ‘gumboots’ (aka wellington boots). After hiking through the bush (not fun in a wetsuit) we crawl down a small hole to get to the caves. Then it is a glowworm experience, and I have to admit it is pretty cool. Glowworms in abundance. They form constellations in the dark, and it’s hard to remember that we are underground and not outside, under the stars. Glowworms are actually fly larvae (aka maggots) and the light they produce is their waste product. That casts a different light on the star analogy. When we turn our headlamps back on, we can see the dangling strings of web they hang to catch their food. Each worm drops between 20 and 30 lines. In the light, you can see the larvae wriggling along their web like translucent liquid through a straw. The first tubing tunnel is fun. We jump into the tubes from a tall ledge and float through in the dark. The tunnel is called “aria alley” and we sing everything from love songs to ‘Happy Birthday.’ After that it is a matter of crawling over jagged rocks, avoiding stalagtites (and -mites) and trying to keep the frigid water out of our gumboots. “Uncle boy” is the enigmatic owner of a Maori homestead in Maketu. Stray advertises this as the best night on tour and the excitement is high. Uncle Boy gives us all a big welcome speech and we perform the traditional Maori greeting of touching noses. Then… eats! It’s not a traditional hangi (where food is cooked in steamy ovens in the ground) but the food is yummy anyway. The best part by far is the dessert… a delicious pavlova. After dinner, the fun really begins. A group of young people (between 5 and 23) from the area perform a traditional Maori welcome dance for us. It’s one of the most unwelcoming dances you can imagine, as they make some scary faces with wide eyes and poking-out tongues. But we are assured that it only means good things… I can’t imagine what the first Europeans to watch one of these dances must have thought. They probably believed they were about to be killed and steamed in the hangi! The girls all have a ball on a string (a ‘poy’) which they twirl around with incredible skill. The boys are slapping their thighs and shouting and hitting each other with force, performing the ‘haka’. It’s these last two dances that we are going to learn. We’re split up into boys vs girls and the boys go into another room to learn the haka. All the girls are given a poy to work with and we are taught a basic (but tricky!) routine with a fair bit of shouting and looking scary involved… but mostly spinning and shaking our hips to the music. After about 15 mins of practice we are joined again by the boys and they give a stunning rendition of the haka! Talk about scary – but in a good way – for sure! It makes our rendition of the poy right after look positively lame by comparison. We all sleep en commune for the night and wake up (early) again, to head to Rotorua and Taupo for St. Paddy’s Day! Yes, this entry is that out of date… I’m trying desperately to catch up but there just aren’t enough internet hours in the day!